ISLAMABAD: Why is only the judiciary being made the target of extraordinary parliamentary oversight? The good work of the Rabbani-led constitutional committee apart, it is not seeking any parliamentary oversight of any of the other key civil or military appointments…. Despite spending hundreds of billions of rupees on policing, prosecution and courts in the name of reforms to secure the life and property of the people during the last 10 years, crime throughout Pakistan has increased by almost 50 per cent in this period…. July 06, 2009 “Dawn” — – While we’re still arguing about whether there’s life after death, can we add another question to the cart? 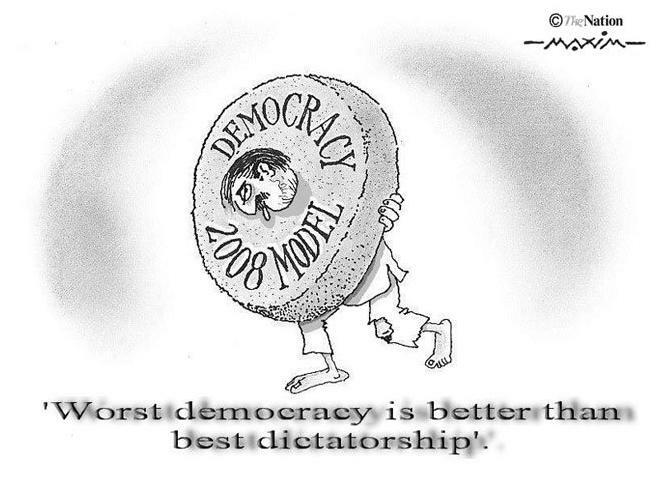 Is there life after democracy? What sort of life will it be? By democracy I don’t mean democracy as an ideal or an aspiration. I mean the working model: Western liberal democracy, and its variants, such as they are. Isn’t it any surprise then that we have a “pro-poor” budget raises the price of items that they consume the most and encourages them to spend what’s left on cheap cell phones(see Pulses, tea to become costlier, cellphone cheaper)? Petroleum development levy to end in FY10 BUT Carbon surcharge will be introduced in FY10. So Hina giveth and Hina taketh away…. Withholding tax on domestic vehicles ended. Ah, the poor must be really excited since they can’t even afford a bicycle…. Agriculture and value addition to be given special attention. Ah, so Rs 18 billion for Agriculture will cover it. Compare that to Rs 262 billion allocated for federal ministries.